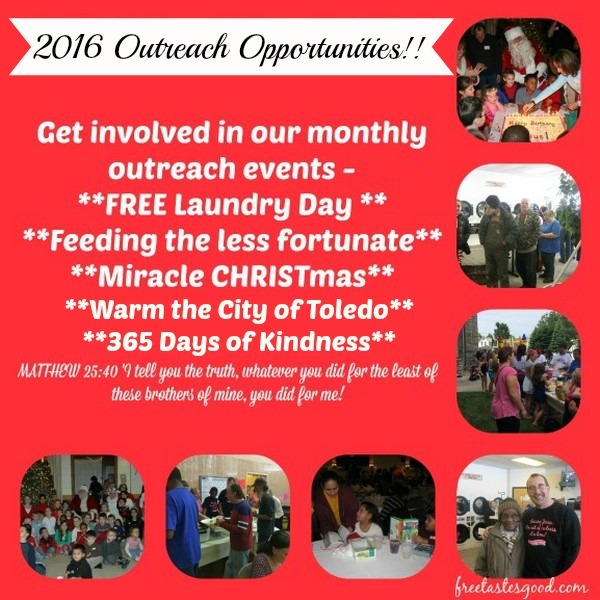 FreeTastesGood Outreach Opportunities for 2016!! | Free Tastes Good! FreeTastesGood Outreach Opportunities for 2016!! 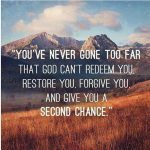 If you have been following the blog for long, you know we provide a monthly meal for the homeless/less fortunate and we also started a FREE Laundry Project, where we go to local laundromats and provide FREE Laundry for families in need. It has become a cool thing watching God at work and lives impacted. We have the 2016 Outreach Opportunity Schedule. In addition, this year, we have added a special monthly project to bless an organization in our area, etc. We are very excited about this. Each month, I will post a sign up sheet for the events. For the meals I am just posting the main dish, but we always provide a large selection of side dishes for each meal. We are also always in need of monetary donations to help with the outreaches. I have several that have signed up to have a certain amount donated monthly. This is such a huge blessing that we appreciate so much. Remember none of us can help everyone, but ALL of us can help someone, and when we do, we serve Jesus!! We can do this together!! 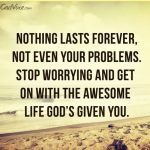 SPECIAL MONTHLY PROJECT – Donating diapers and wipes to a Pregnancy Center, Heartbeat of Toledo, or a family you know in need for Sanctity of Life Month – most of you know my story of abortion. SPECIAL MONTHLY PROJECT – We will be making up Birthday Boxes (filled shoeboxes)- similar to Operation CHRISTmas Child, but they will include a Birthday Cake, frosting, candles, and a few gifts for boys and girls. We have many children that come to our FREE Community meals that tell us it is their birthday, so this is a cool way to celebrate with them. SPECIAL MONTHLY PROJECT – Hygiene Care Packages (Blessing Bags) and Easter Baskets for our FREE Community Easter Dinner. SPECIAL MONTHLY PROJECT – Donate Laundry Detergent to Broken Chains Church. This is a church that ministers to many homeless people. They have a washer and dryer and allow these people to do their laundry for FREE at their church. I would love to bless them by supplying all their laundry detergent, etc for a year. SPECIAL MONTHLY PROJECT – Feminine Care Products for our friends at Glenwood Elementary. Many of the children at this school do not have access to these products. SPECIAL MONTHLY PROJECT – Blankets, Scarves, hats, gloves, socks, chapstick for our 2nd annual Warm the City of Toledo Project where we will be tying these to trees for our homeless friends. We appreciate all the support & prayers we have received and have been so blessed to meet so many of the volunteers, and get to know so many of you personally. Thank you so much for your continued support. We would appreciate all the prayers for the 2016 outreaches as well. May God be glorified in all that we do! These are all cool ways to give back and be the hands and feet of Jesus. Love you guys!